I've used a few software modeling and design packages over the years to help with architectural drawing and furniture design, starting first with Claris CAD on a much-earlier Mac in the mid 90s in high school! Though I considered myself an expert on that, having taken a few semester-long classes on it, and continuing to use it for personal projects in the years just after college, a few computer upgrades, and operating system changes, combined with a multi-year hiatus from woodworking (and the related drawing), meant that I had to start over whenever I needed to draw since then. I've never spent enough time with any other packages in the intervening years to consider myself even just "proficient", dabbling in AutoCAD, LibreCAD, QCAD, and SketchUp when a need to produce something more precise or complex arose. But when I added the CNC machine to my shop - see more about that here - I knew I needed to learn something that could send commands to that tool. The XCarve CNC comes with a free subscription to the web software Easel for exactly that purpose, but while Easel is incredibly easy to learn, it's also incredibly limited in it's capabilities. After reading a lot of reviews - and focusing on three key criteria of free, Mac-compatible, and XCarve compatible - I came across Autodesk's Fusion360 software. I'm still no expert in this software. Indeed, its so powerful it seems like folks might spend years working with it, and still only know one small area in depth. 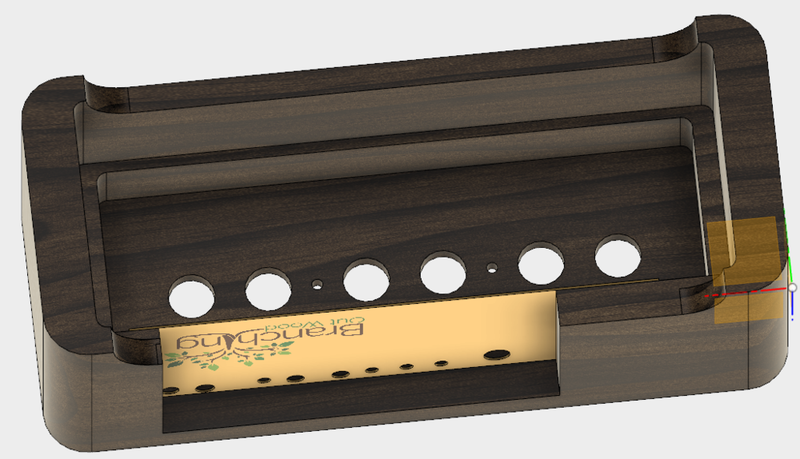 But it's become my go-to tool now not only to drive the CNC, but for rendering commissions. This isn't a tutorial - I'm far from knowledgeable enough to even consider that, and there seem to be hundreds of great sources for that already. But rather, this is just an opportunity for me to share a few of the different renderings I've done for clients. Though the design wasn't complex enough to require a rendering, as the client considered different woods for the surface, this really helped them finalize the walnut and maple combination. For far more details on this piece, check out this post. A commercial client refurbishing a carousel in Irvine needed 24 oval mirror frames, each of which was comprised of 4 pieces end-joined with tenons. While this may have traditionally be cut with a template, I found it much easier to do with the CNC. So here, the drawings were only necessary as a way to control the CNC. An in-progress addition to my catalog, a pair of these wooden pieces will sandwich nine stained glass tiles. This also gave me opportunity to learn and take advantage of constraint-based modeling, wherein instead of defining a model by the length of each line, the model is defined by relationships between the lines such as "perpendicular" or "equally spaced", so if I want to change the size of one side, or the size of the glass inserts, rather than redrawing the entire piece, I can just update one number and see the entire model update. The body of the long-in-progress Nixie clock I just recently completed was first attempted via manual milling with my drill press; this was the initial impetus for the CNC. This used the CNC in th places: milling out the wooden block; drilling out the control panel; and then engraving the logo and the control panel labels. A request came in for a decorative box to hide a cable box and media devices and cables, with a built-in shelf and ventilation holes that I designed to double as handles. This was never built. 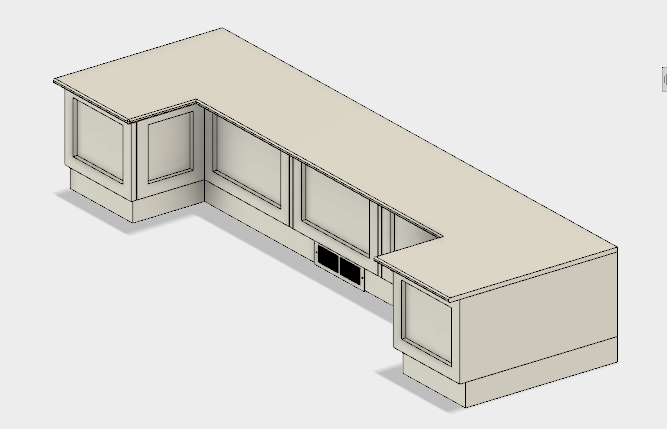 This oddly-shaped shelf is for a kitchen counter of a houseboat in Emeryville; the rendering helped her understand the final product. I also took advantage of the capability to produce projected dimensioned drawings very quickly from a model; as I updated the model, the projected drawing also automatically updated, making it much easier for me to build the final product. 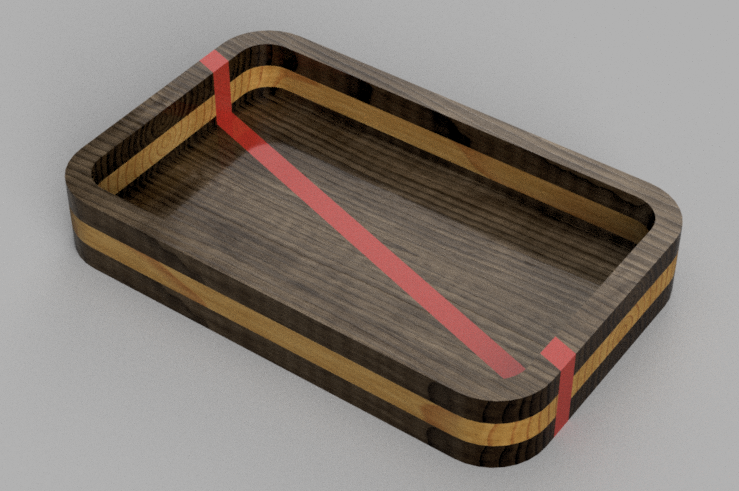 The original request to feature a purpleheart stripe led to the rendering at left, which helped refine the design to what I ultimately created at right. 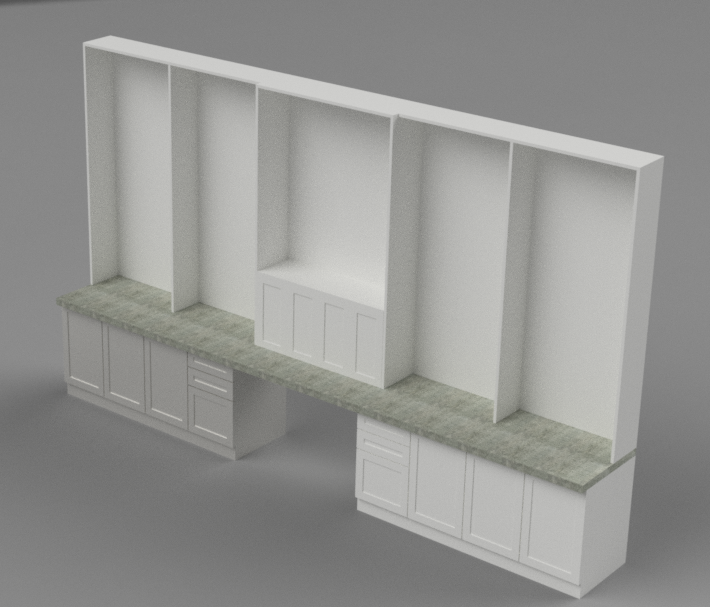 This client had a firm idea of what they wanted for the kitchen, but was a bit more nebulous on the wall of bookshelves & desk for the study. Regardless, as both pieces were fairly substantial, a detailed line drawing, and a rendering in white paint helped advance the conversation. OK so I'm obviously quite new to the modeling (as opposed to drawing) world: wow, it automatically produces projection drawings for you? This was probably news fifteen years ago! And I'm just barely scratching the surface of the software's capabilities - for instance, I could do a structural analysis of anything I model as well! Not bad for free, eh? So long as you have under $100k in revenue - or use this for academic purposes - it's free. So check it out, or share your thoughts on what software you know and love! And... if anyone has software to open those 1990s-era Claris CAD drawings I did way back when, let me know! I'd love to see what crazy (or probably quite mundane) designs I was coming up with back in my teens.